miR-126-3p target sequences selectively protect ECs from the antiproliferative effects of p27. (A) RT-qPCR analysis of miR-126-3p expression. (B) Schematic representation of the p27 expression cassette in the Ad vectors engineered to inhibit overexpression of exogenous p27 in cells expressing miR-126-3p (i.e., ECs). (C) Representative immunoblot of p27 protein expression from 3 independent experiments accompanied by densitometric quantification. Lanes were run on the same gel but were noncontiguous. For each cell type, p27 expression was normalized to each vector’s GFP expression to account for transduction efficiency. 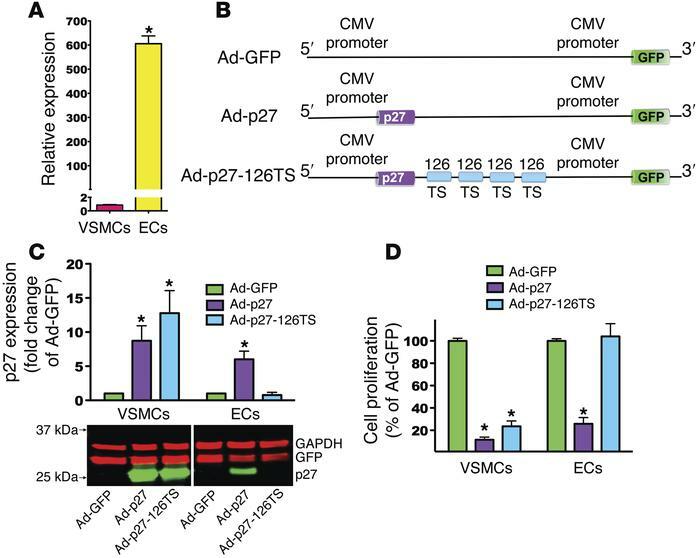 (D) Proliferation assays of VSMCs and ECs transduced with the indicated Ad vector. Data represent the mean ± SEM of at least 3 experiments performed in quadruplicate. Data comparisons were made using 1-way ANOVA with Tukey-Kramer’s post hoc test. *P < 0.01 versus VSMCs (A); *P < 0.01 versus Ad-GFP (C and D).